A self-hosted, web-based application to stream your music, everywhere. Sonerezh is a self-hosted, web-based audio streaming application allowing you to access your music from anywhere, using your favorite web browser. Tell Sonerezh where your music is stored and that's all. It will parse and extract the metadata of each files to built its own database. We currently support MP3 and MP4, OGG/Vorbis (.ogg and .flac) files. Browse you favorite music through several beautiful views, sort your collection by band, album, date, etc. Sonerezh is easy to install thanks to its automatic deployment tool. No headaches with configuration files. This documentation will NOT cover the installation of NGINX or PHP. A lot of tutorials are already available on the web. 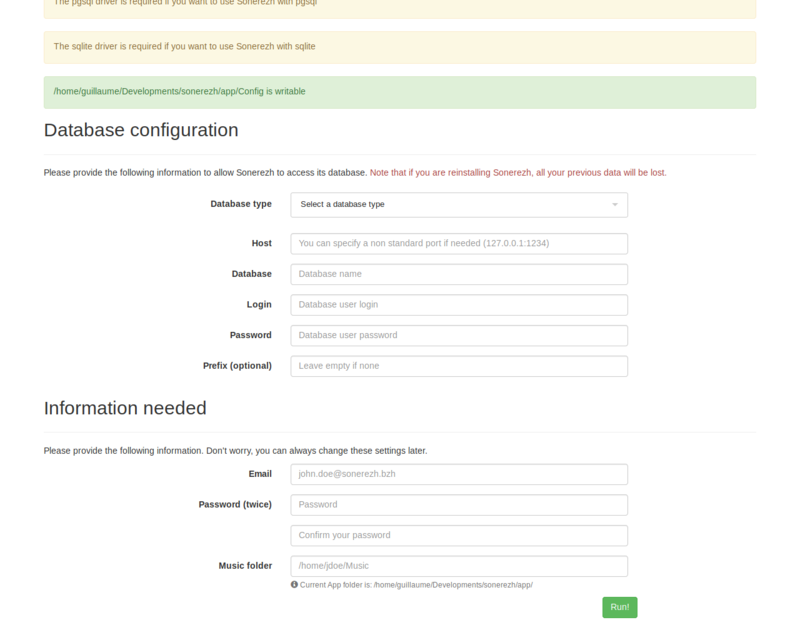 However, configuration samples are available for NGINX or Apache. The releases are published on GitHub, but you should download the latest stable release from sonerezh.bzh. # Replace tar.gz with zip if needed. Where <changeme> is the password used by the MySQL user. You may want to allow the web server system account to read this directory. Usually its www-data. Now you can go to http://127.0.0.1/install (or whatever configured domain name) to set the database settings and create the first user. If all goes well you should be redirected to the login page.